PRODUCT DESCRIPTION: Aerosol used to control flying insects which is applied via one of our Aerosol machines (AERO 1000, AERO 2000,or AERO 3000). Simply set the can in the machine, configure it for when you would like it to release aerosol and you are all set to go. Pyrethrin has long been one of the best materials used for controlling just about any type of flying pest. TARGET INSECT: Flies, moths, gnats, mosquitoes and just about anything that flies. WHERE TO USE IT: Inside or outside; homes, restaurants, and just about any building. RATE OF APPLICATION: There are varying rates of application. Since these cans are used in aerosol machines, you can set them to go off as frequently as needed. As a generally rule, 6000 cubic feet per machine is a good guideline to use when trying to determine how many may be needed for any given installation. 6000 cubic feet is a large area and is basically the total of the following dimensions: Height times Width times Length. For example, a room that has a 10 foot high ceiling, is 20 feet wide and is 30 feet long will have a cubic sq/footage of 6000 sq/ft. 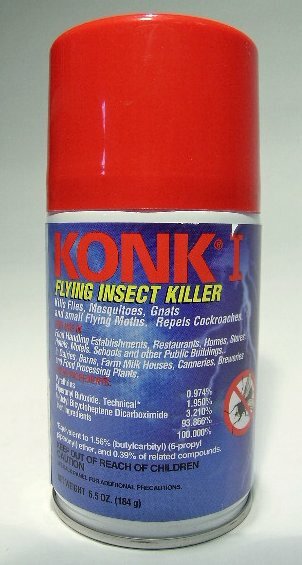 Do you sell the Aerosol machines for konk replacements? If so how much? I suggest you get one and give it a try. If you're not able to get the can to fit, you'll be able to return it for a full refund.